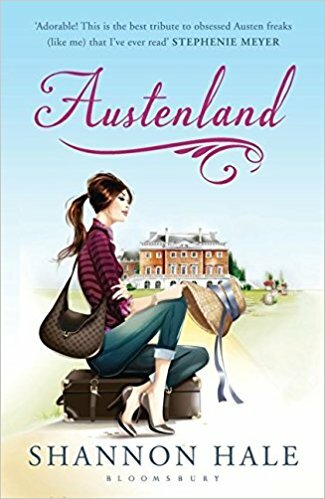 In Austenland a 32 year old New Yorker, who is obsessed with Mr. Darcy but hasn’t yet been able to find him in real life, buys the perfect vacation at an English resort called Pembrook Park which is dedicated to Austen’s aficionados. There the guests are received by hosts playing the part of regency gentleman, gentlewoman, servants, stable boys etc. and no technology or use of modern expressions or clothing is allowed to permit the guests to fully live a regency experience. Now, this is heaven on earth right? I mean, if there were such a place I would be the first to buy a ticket! This is every girls holiday dream…well, every Janeite holiday dream I suppose… or at least mine. I was intrigued with the plot in Austenland and kept wanting to find such a place and spend an entire month there, but I could not relate or love the characters in the book. The main character, Jane Hayes, seemed a bit childish for a 32 year old woman, and the hero captured my attention throughout the entire novel but did not meet the expectations in the end of the book which is, by the way, very different from the movie. I prefer the character and consequently the ending of the movie which was much more logical and romantic in my perspective, and even if other aspects are better in the book, in my opinion, this one in particular lacks in comparison with the adaptation. At Pembrook Park, the main character encounters other woman who have also bought this dreamy vacation and is exposed to other peoples foibles which was interesting because it reminded me a little of Austen’s intentions in her books. Facing her own love story Jane also starts questioning if this regency world and the perfect Mr. Darcy are indeed what she really wants or needs. After all, one thing is to read and dream about regency life knowing we will have all the comforts of the 21srt century once we close the book, another thing is to actually live it. This self appraisal was what I enjoyed the most in this character because it made me question myself and it brought this funny story a more serious tone. Overall I think the book is quite entertaining and the plot is very original, particularly if we consider this book was written over 8 years ago, but as I could not relate or respect the main character I never felt much involved in it and therefore lost interest. It is a light and entertaining book though and if you are looking for something original and funny this may be your cup of tea. I have not read this book but I have watched the DVD version several times and enjoyed it. Good review. I do like the ending in the movie but not having read the book cannot make a comparison. Like Sheila I haven’t read the book but I do have the DVD which I enjoyed but have so far only watched once. I have never felt the urge to read the book and now knowing it has a different ending I will probably not read it any time soon. Thanks for your review Rita. Hi: Recently read it as well, because I did see/like the film. I think the film did a good job of making the main character more likable, and also the ending I think was a little bit more polished. But it is a nice “Jane Austen universe” type read! It’s not that often that a movie adaption is better than the book, but it does happen. I’ve enjoyed the movie and planned to read the book. I still will, but I’ll keep in mind that there are strong differences. Great review, Rita! So glad to see you read and review some of these older releases, Rita! It is lovely to see them get some attention. 🙂 I do remember liking Jane Hayes myself, but maybe it is different if you read the book first before seeing the movie? I feel that way about The Jane Austen Book Club – I adore the movie and I did see it many times before reading the book (which I was not a fan of). I don’t know if you saw, but there is a sequel of sorts to Austenland that has more mystery in it – Midnight in Austenland – not sure if it is one you might like more or not. Either way looking forward to seeing what you read next!